“The times they are a-changin’,” belted Bob Dylan in his iconic 1964 song that tapped the revolutionary ethos of the decade. The first time I went to the annual Woodstock for capitalists in the Swiss village of Davos back in 2005 (to launch the inaugural Global 100 Most Sustainable Corporations in the World ranking), Dylan’s lyrics would have been the last theme song in the universe chiming in my head. How the music has changed. 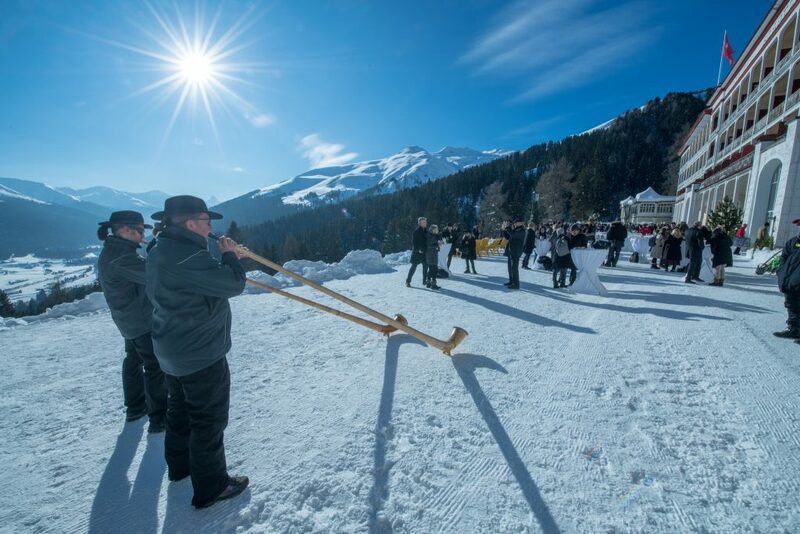 In 2019, it’s not just Corporate Knights crooning about sustainability in the Swiss alps. Now, the world’s biggest investors are dancing to the same beat, even if they still look a little awkward on the dance floor (anyone who made the McKinsey soiree at the Belvedere Hotel will know what I am talking about). On Tuesday, François Riahi, the CEO of Natixis, a French bank with assets under management of $1 trillion, told guests at a dinner in the Belvedere Hotel, hosted by Corporate Knights and Climate Bonds Initiative, that his bank has introduced a Green Weighting Factor. Weighting factors go to the heart of how bankers allocate money and this one aims to promote finance deals with a positive impact on both the climate and the environment at large by adjusting the expected profitability threshold on various transactions according to their effects on climate change. Riahi said that he sees a point not far off where two companies with the same financial profiles will have different costs of financing based on their alignment with a 2° C or less world. We also heard from an executive at BNP Paribas (one of the ten largest banks in the world) that the bank has set – and met – a target of 15% of its corporate loans being dedicated to furthering the UN Sustainable Development Goals (SDGs), in part because they link executive bonuses to achieving the target. 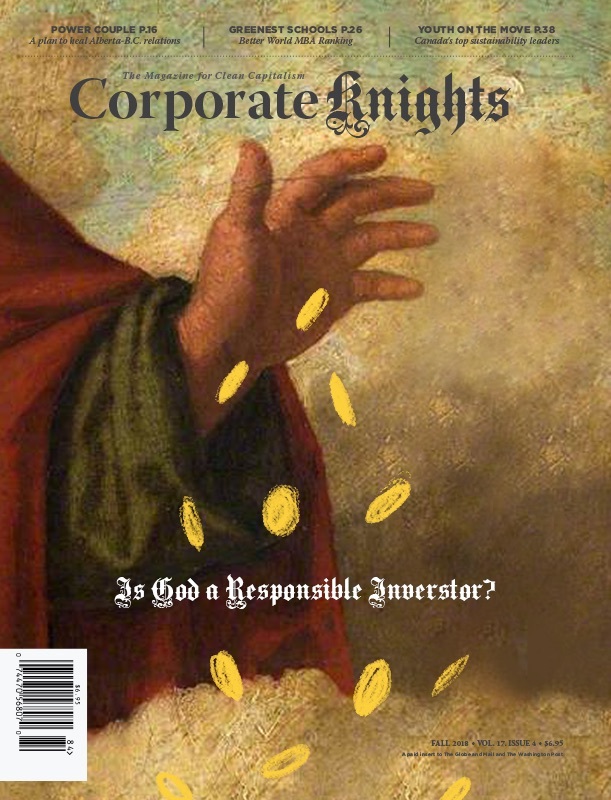 After dinner, I swung by a reception hosted by Steve Forbes of the eponymous Forbes magazine (otherwise known as the bullhorn for red-blooded capitalism), whose main (and most read) story published that day was a feature on Corporate Knights’ Global 100 Most Sustainable Corporations. Whereas past incarnations of the Forbes Davos shindig showcased magazine covers celebrating the wealthiest people on the planet, this year the blown-up cover on display beside the champagne flutes was for the Just 100, a ranking of America’s most just companies. Wednesday morning on the way to breakfast, I picked up one of the many free copies of the Financial Times on offer. As I was leafing through the paper at breakfast, I couldn’t help notice two of the largest investors in the world (UBS $3.2 trillion, and Amundi with $1.5 trillion) had taken out prominent ads extolling that they were going all-in on sustainable investing. The remarkable part, and sign of the times, was that the venerable Financial Times fell for it, publishing a story that the world’s largest investor was going to dump companies failing to comply with the Paris accord, before Blackrock clarified it was hoax. The fact that such a story could be deemed plausible by the world’s financial newspaper of record tells us how far perceptions on sustainable investment possibilities have come in just a short time. Later that evening at a dinner focused on financing the sustainable development goals, an academic from Cambridge University, Ellen Quigley, challenged Scott Mather, chief investment officer of Pimco, one of the world largest bond fund managers (with $1.8 trillion assets under management), to account for what his firm is doing to defund “zombie companies” out of step with a sustainable low carbon future. I was expecting a canned answer but was instead surprised by Mather, who between bites from his poached pear desert, noted that they are keenly aware of companies at risk of “zombification” and are already taking measure to reflect this in their credit ratings and in the make-up of their investment portfolios. There is no question in my mind that we can find a way to reconcile humanity with a livable planet. The question is whether this happens smoothly within our current capitalist system or with great upheaval. If capitalism is going to adapt and survive as economies change to become symbiotic with the planet and society, it will require a new mindset which appreciates that healthy markets require healthy societies, and that serving society is not incompatible with serving shareholders—within reasonable limits. #1 Do focus on the big numbers. Plastic straws matter symbolically, but if China’s Belt and Road Initiative (China’s multi-billion Marshall-esque Plan for economic development along the old Silk Road route) doesn’t have sustainable design principles embedded, its impact will be on par with adding two China’s worth of carbon emissions to the planet, as Simon Zadek, the UN man charged with figuring out how to finance the SDGs, pointed out. #2 Put your money where your mouth is. Let’s make sure major capital flows all go through the lens of sustainable development, including the sleeping giant, corporate pension plans. That could unlock trillions of dollars for green investment, as the heads of the world’s largest corporate and investor sustainability initiatives have called for. #3 Hold investors to account. While corporate sustainability rankings abound, it’s time to rank the world’s largest investors on what they’re doing to bring about a sustainable world (stay tuned on this one). #4 Put more women in charge. Dominique Reiniche (the chair of Chr. Hansen, the most sustainable corporation in the world), Angela Merkel (climate warrior and closest thing we have to a leader of the free world), New Zealand’s rock star PM Jacinda Ahern (who is going beyond GDP with a well-being budget to guide her government’s priorities), and the trailblazing heads of the world’s largest corporate (Lise Kingo) and investor sustainability initiatives (Fiona Reynolds) are all women. Notice a pattern. #5 Scale bottom-up solutions. While the big institutions of yesterday are coming around, their inertia makes it more likely that transformational solutions will emerge from bottom-up sources that harness the better angels of human nature. #6 Champion new visionaries for a sustainable economy. It’s time to replace yesterday’s capitalist icons with new heroes that point the way to a sustainable planet, like Mariana Mazzucato in her new screed, The Value of Everything, that lays out a powerful framework for purposeful capitalism and Oxford’s Colin Mayer, author of Prosperity: Better Business Makes the Greater Good. #7 Do stay in touch with the nature. Its essence will sustain and inspire this journey, as Jane Goodall and 17-year old wildlife photographer, Skye Meaker (my bus-mate from the Zurich airport), emphasized. If the proprietor of local cross-country ski rental shop is any indication (“we are not big fans of the WEF because they’re too busy with their meetings to go skiing”), the Davos men and women still have some work to do here. #8 Do swim against the current—it could be the best way to get ahead of the pack which is still extrapolating from the past to predict a future that is going to be radically different. As Bill Gates wisely reminded: We always overestimate the change that will occur in the next two years and underestimate the change that will occur in the next ten. #9 Exercise persistence. Nothing worthwhile is easy. #10 Get out of your comfort zone. That’s the best sign that you may be doing a jig that has legs.